Posted byMarjolijn	 March 22, 2013 March 11, 2019 Leave a comment on PhD thesis in the pocket! The 22th of March was the Big Day, I had to defend my PhD thesis. After a 10 minute summary about my research I had one hour to answer the questions of 8 (associate) Professors. 1.5 hours later this happy photo was taken. Standing with my Phd between my (co-) promoteres; Tjeerd, Marieke, Peter, Leon, Jan. Leon, Marieke en Tjeerd also gave a great talk about me and the research. Thanks so much for your support these great 5 years! My sincere gratitude and another big thank-you to all for your (digital) presence and support during my defence ceremony. 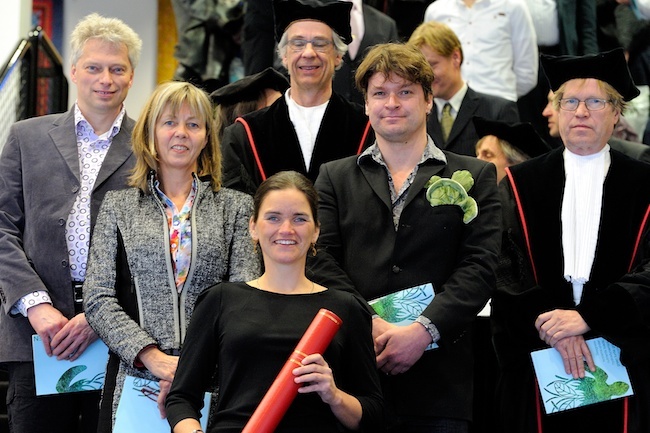 It was a very special day (ps don’t forget to read the “Acknowledgements” of my PhD thesis. Here some more pictures from the big day (Photos taken by Vincent de Jong).